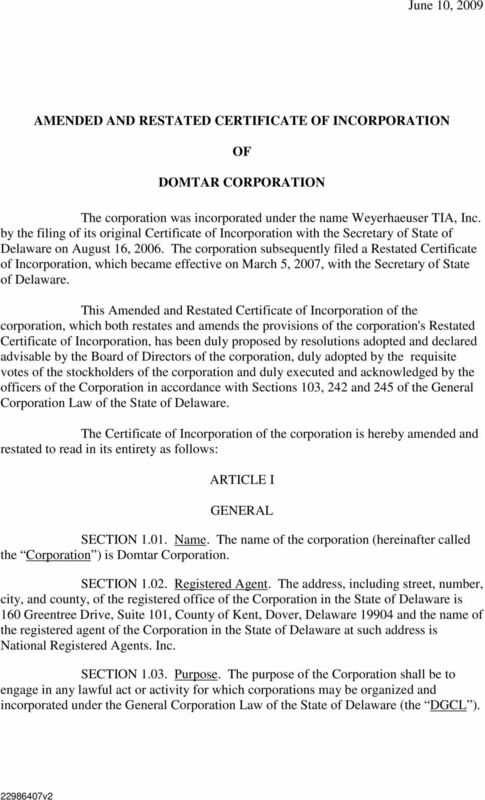 Download "AMENDED AND RESTATED CERTIFICATE OF INCORPORATION DOMTAR CORPORATION"
1 June 10, 2009 AMENDED AND RESTATED CERTIFICATE OF INCORPORATION OF DOMTAR CORPORATION The corporation was incorporated under the name Weyerhaeuser TIA, Inc. by the filing of its original Certificate of Incorporation with the Secretary of State of Delaware on August 16, The corporation subsequently filed a Restated Certificate of Incorporation, which became effective on March 5, 2007, with the Secretary of State of Delaware. 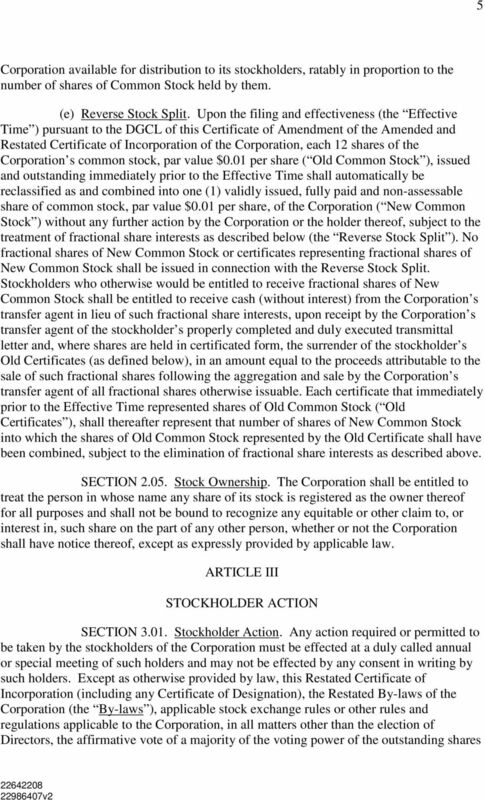 This Amended and Restated Certificate of Incorporation of the corporation, which both restates and amends the provisions of the corporation's Restated Certificate of Incorporation, has been duly proposed by resolutions adopted and declared advisable by the Board of Directors of the corporation, duly adopted by the requisite votes of the stockholders of the corporation and duly executed and acknowledged by the officers of the Corporation in accordance with Sections 103, 242 and 245 of the General Corporation Law of the State of Delaware. The Certificate of Incorporation of the corporation is hereby amended and restated to read in its entirety as follows: ARTICLE I GENERAL SECTION Name. The name of the corporation (hereinafter called the Corporation ) is Domtar Corporation. SECTION Registered Agent. The address, including street, number, city, and county, of the registered office of the Corporation in the State of Delaware is 160 Greentree Drive, Suite 101, County of Kent, Dover, Delaware and the name of the registered agent of the Corporation in the State of Delaware at such address is National Registered Agents. Inc. SECTION Purpose. 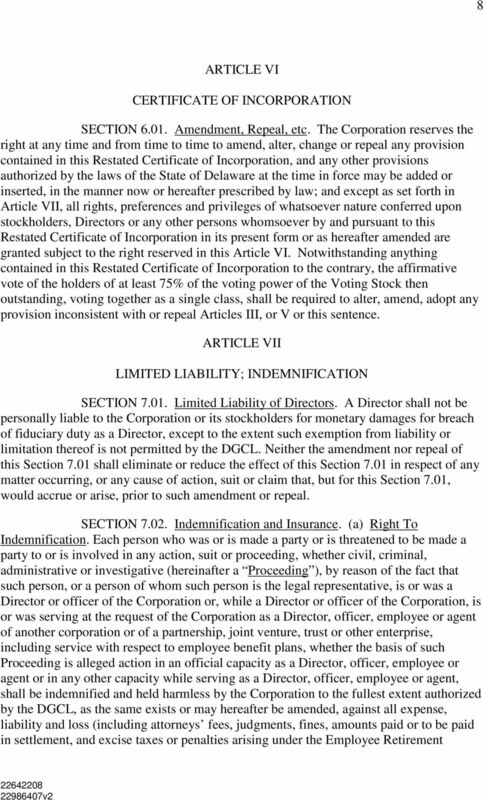 The purpose of the Corporation shall be to engage in any lawful act or activity for which corporations may be organized and incorporated under the General Corporation Law of the State of Delaware (the DGCL ). 7 7 the rights of the holders of any series of Preferred Stock or any class or series of stock having a preference over the Common Stock as to dividends or upon liquidation, dissolution or winding up to elect Directors under specified circumstances, newly created directorships resulting from any increase in the number of Directors and any vacancies on the Board of Directors resulting from death, resignation, disqualification, removal or other cause shall be filled by the affirmative vote of a majority of the remaining Directors then in office, even though less than a quorum of the Board of Directors, and not by the stockholders. 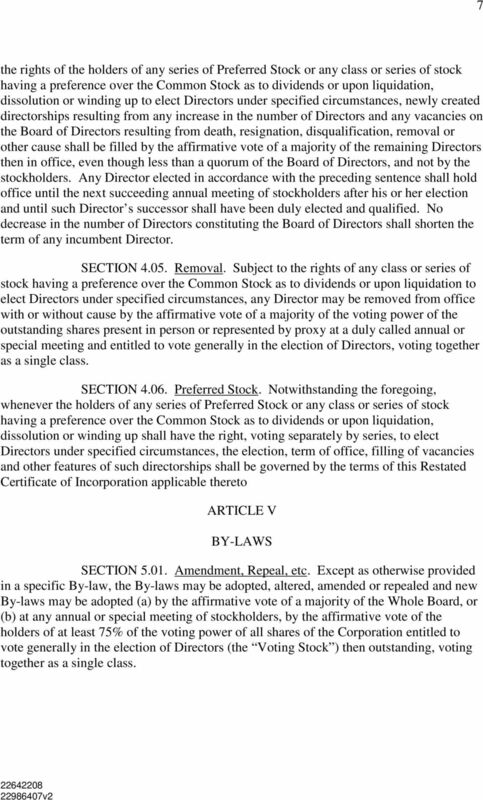 Any Director elected in accordance with the preceding sentence shall hold office until the next succeeding annual meeting of stockholders after his or her election and until such Director s successor shall have been duly elected and qualified. No decrease in the number of Directors constituting the Board of Directors shall shorten the term of any incumbent Director. SECTION Removal. 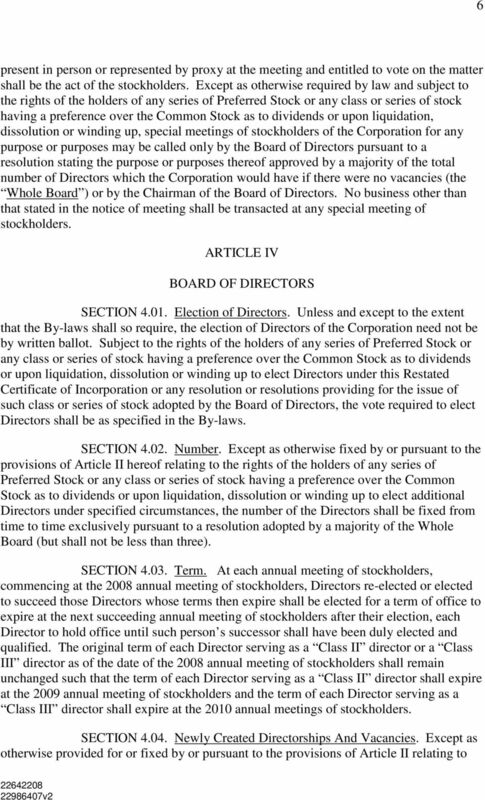 Subject to the rights of any class or series of stock having a preference over the Common Stock as to dividends or upon liquidation to elect Directors under specified circumstances, any Director may be removed from office with or without cause by the affirmative vote of a majority of the voting power of the outstanding shares present in person or represented by proxy at a duly called annual or special meeting and entitled to vote generally in the election of Directors, voting together as a single class. 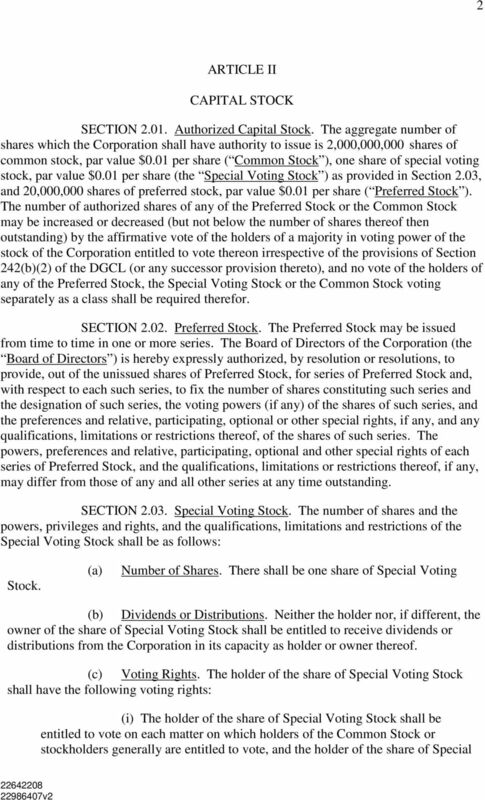 SECTION Preferred Stock. 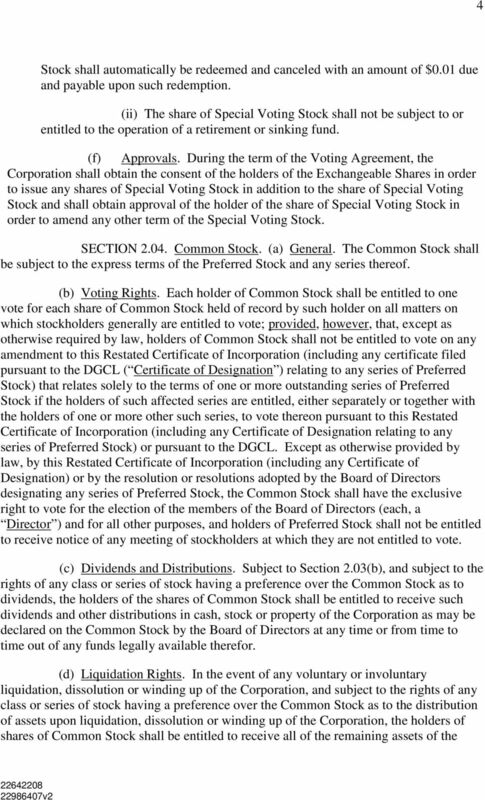 Notwithstanding the foregoing, whenever the holders of any series of Preferred Stock or any class or series of stock having a preference over the Common Stock as to dividends or upon liquidation, dissolution or winding up shall have the right, voting separately by series, to elect Directors under specified circumstances, the election, term of office, filling of vacancies and other features of such directorships shall be governed by the terms of this Restated Certificate of Incorporation applicable thereto ARTICLE V BY-LAWS SECTION Amendment, Repeal, etc. 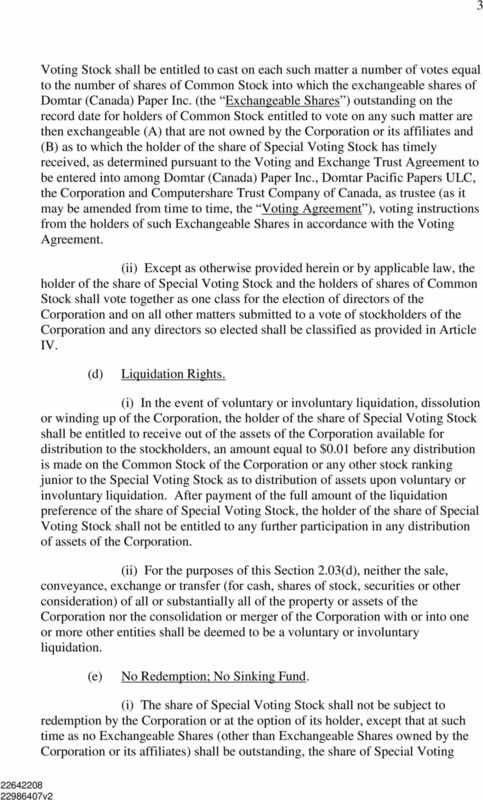 Except as otherwise provided in a specific By-law, the By-laws may be adopted, altered, amended or repealed and new By-laws may be adopted (a) by the affirmative vote of a majority of the Whole Board, or (b) at any annual or special meeting of stockholders, by the affirmative vote of the holders of at least 75% of the voting power of all shares of the Corporation entitled to vote generally in the election of Directors (the Voting Stock ) then outstanding, voting together as a single class. 9 9 Income Security Act of 1974, as in effect from time to time) reasonably incurred or suffered by such person in connection therewith and such indemnification shall continue as to a person who has ceased to be a Director, officer, employee or agent and shall inure to the benefit of such person s heirs, executors and administrators; provided, however, that, except as provided in paragraph (b) hereof, the Corporation shall indemnify any such person seeking indemnification in connection with a Proceeding (or part thereof) initiated by such person only if such Proceeding (or part thereof) was authorized by the Board of Directors. 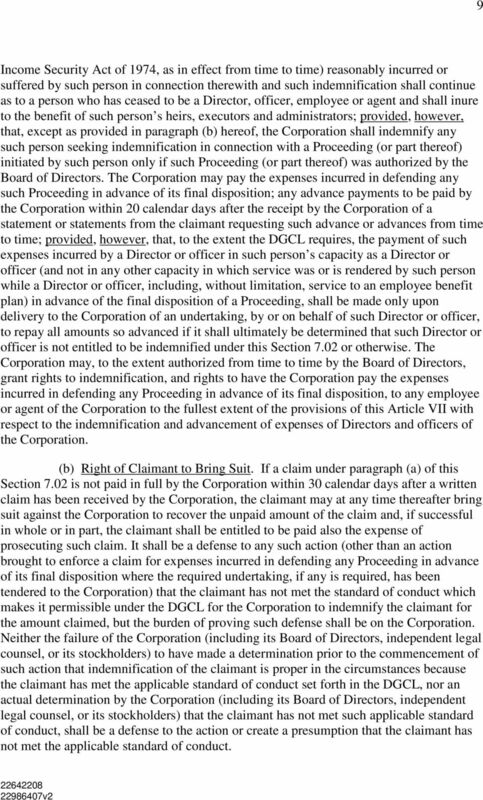 The Corporation may pay the expenses incurred in defending any such Proceeding in advance of its final disposition; any advance payments to be paid by the Corporation within 20 calendar days after the receipt by the Corporation of a statement or statements from the claimant requesting such advance or advances from time to time; provided, however, that, to the extent the DGCL requires, the payment of such expenses incurred by a Director or officer in such person s capacity as a Director or officer (and not in any other capacity in which service was or is rendered by such person while a Director or officer, including, without limitation, service to an employee benefit plan) in advance of the final disposition of a Proceeding, shall be made only upon delivery to the Corporation of an undertaking, by or on behalf of such Director or officer, to repay all amounts so advanced if it shall ultimately be determined that such Director or officer is not entitled to be indemnified under this Section 7.02 or otherwise. The Corporation may, to the extent authorized from time to time by the Board of Directors, grant rights to indemnification, and rights to have the Corporation pay the expenses incurred in defending any Proceeding in advance of its final disposition, to any employee or agent of the Corporation to the fullest extent of the provisions of this Article VII with respect to the indemnification and advancement of expenses of Directors and officers of the Corporation. (b) Right of Claimant to Bring Suit. If a claim under paragraph (a) of this Section 7.02 is not paid in full by the Corporation within 30 calendar days after a written claim has been received by the Corporation, the claimant may at any time thereafter bring suit against the Corporation to recover the unpaid amount of the claim and, if successful in whole or in part, the claimant shall be entitled to be paid also the expense of prosecuting such claim. It shall be a defense to any such action (other than an action brought to enforce a claim for expenses incurred in defending any Proceeding in advance of its final disposition where the required undertaking, if any is required, has been tendered to the Corporation) that the claimant has not met the standard of conduct which makes it permissible under the DGCL for the Corporation to indemnify the claimant for the amount claimed, but the burden of proving such defense shall be on the Corporation. Neither the failure of the Corporation (including its Board of Directors, independent legal counsel, or its stockholders) to have made a determination prior to the commencement of such action that indemnification of the claimant is proper in the circumstances because the claimant has met the applicable standard of conduct set forth in the DGCL, nor an actual determination by the Corporation (including its Board of Directors, independent legal counsel, or its stockholders) that the claimant has not met such applicable standard of conduct, shall be a defense to the action or create a presumption that the claimant has not met the applicable standard of conduct. 10 10 (c) Non-Exclusivity of Rights. The right to indemnification and the payment of expenses incurred in defending a Proceeding in advance of its final disposition conferred in this Section 7.02 shall not be exclusive of any other right which any person may have or hereafter acquire under any statute, provision of this Restated Certificate of Incorporation (including any Certificate of Designation), By-law, agreement, vote of stockholders or disinterested Directors or otherwise. No repeal or modification of this Article VII shall in any way diminish or adversely affect the rights of any Director, officer, employee or agent of the Corporation hereunder in respect of any occurrence or matter arising prior to any such repeal or modification. (d) Insurance. 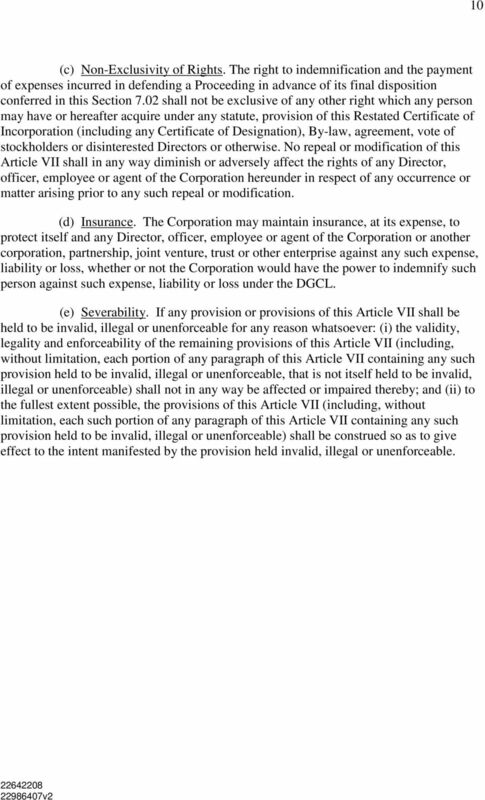 The Corporation may maintain insurance, at its expense, to protect itself and any Director, officer, employee or agent of the Corporation or another corporation, partnership, joint venture, trust or other enterprise against any such expense, liability or loss, whether or not the Corporation would have the power to indemnify such person against such expense, liability or loss under the DGCL. (e) Severability. If any provision or provisions of this Article VII shall be held to be invalid, illegal or unenforceable for any reason whatsoever: (i) the validity, legality and enforceability of the remaining provisions of this Article VII (including, without limitation, each portion of any paragraph of this Article VII containing any such provision held to be invalid, illegal or unenforceable, that is not itself held to be invalid, illegal or unenforceable) shall not in any way be affected or impaired thereby; and (ii) to the fullest extent possible, the provisions of this Article VII (including, without limitation, each such portion of any paragraph of this Article VII containing any such provision held to be invalid, illegal or unenforceable) shall be construed so as to give effect to the intent manifested by the provision held invalid, illegal or unenforceable. SECOND AMENDED AND RESTATED CERTIFICATE OF INCORPORATION TRIBUNE COMPANY. 1. Name. The name of the corporation is Tribune Media Company.